As a child of musical parents, young Josef was influenced by many cultures. 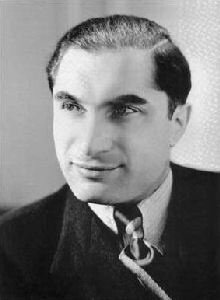 In addition to his native Yiddish, he learned Hebrew and became fluent in Romanian, German, French and English. His first vocal training was as an alto boy in the synagogue of nearby Czernowitz. His talents were quickly recognised and by 1924 he was featured in his first solo recital in Czernowitz singing traditional Jewish songs and arias by Verdi, Puccini, Rossini and Bizet. Soon he moved to Berlin and took piano and singing lessons from Professor Hermann Weissenborn. He returned to Romania for his military service and became cantor of the Czernowitz synagogue. In 1929 he went back to Berlin, where Cornelis Bronsgeest, a famous Dutch baritone, engaged him for a radio broadcast as Vasco da Gama in Meyerbeer's L'Africaine. This was the beginning of a successful international career. Due to his diminutive stature (he was just over 1.5 m) a stage career was impossible, however his voice was extremely well suited for radio. He made many records, first for Ultraphone, then for Odeon/Parlophone, was featured in many radio broadcasts and acted in several movies in both German and English. Ironically, Josef Schmidt enjoyed his greatest successes during the rise of the German Nazis, who subsequently prohibited Jewish artists and writers to work. In 1937, he toured the United States and performed in the Carnegie Hall together with other prominent singers such as Grace Moore. The Nazis banned him from performing in Germany and Austria, but he was still very much welcome in The Netherlands and Belgium, where he was immensely popular. In 1939, he visited his mother in Czernowitz for the last time. When the war broke out that year he was caught in France by the German invasion. He attempted to escape to the United States but, unfortunately, this failed. Making a dash for the Swiss border, he was interned in a Swiss refugee camp in Gyrenbad near Zurich in October 1942. He had been already in frail health. Harsh camp life and lack of medical care brought about a fatal heart attack on November 16, 1942. He was only 38 years old. He had a sweet lyric tenor voice with an easy high register, sailing up even to a high D. His warm timbre was perfectly suited for the melodies of Schubert and Lehár. His popular song recordings were the best-sellers of that age. Hear Josef Schmidt in a 1933 recording from Korngold's "Die Tote Stadt." The text and photograph on this page comes from the Wikipedia web page for Josef Schmidt that can be found here.